Presentation software allows your sales reps to pitch your products and services more clearly, powerfully and professionally to your customers. We looked at the available options and decided to review Slidebean, Canva and PowerPoint. 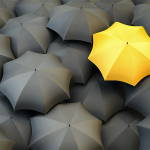 These three options cover the range for small business in terms of features and support. If you want to learn more about the all the other aspects of delivering a sales pitch, I recommend reading How to Create a Winning Sales Pitch. We recommend Slidebean because it’s the easiest presentation software to use and allows non-graphic design experts to create professional-looking presentations in minutes rather than hours. Add photos, videos & audio. We recommend Slidebean because it’s very easy to use and great value for money (when you take the cost of images into consideration). Slidebean’s philosophy is to rely on you to enter your content, and then use its “magic beans” to turn your content into a professional looking presentation. Having tested Slidebean, I have to say that it’s intuitive, easy to use and the finished results do look great. Slidebean does cost more for one user than the other presentation software options, but is roughly the same cost as Canva if you sign-up 3 or more users. Not to mention, Slidebean provides access to millions of high-quality images and GIFs that you can use for free. So if you make a few slide decks each month, and use images as much as you should, Slidebean will soon work out more cost effective, even for one user. Slidebean is the only presentation software option that allows you to track your viewer’s behavior for each presentation. You can find out when, where and for how long they viewed your presentation as well as which slides they looked at for the longest. 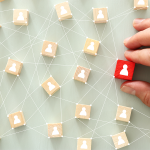 This sort of information is like gold-dust in the right sales reps hands as it helps them to prioritize their opportunities and know who to call, when to call and what to talk about. Finally, one of the things that really impresses me about Slidebean is that even though it is the easiest platform to use when compared with our other options, Slidebean still provide the most comprehensive customer support and training. For instance, you get 1-hour of free advice each month from a designer built into your monthly subscription to provide you with advice and tips on how to raise your game. The only aspect of Slidebean that is missing is a tablet-based editor. Having said this, it’s not a big downside as most businesses create important presentations on their desktop. Canva also makes it easy to design unique, high-quality presentations, with the added perk that you can use many tools for free. Canva has over 8,000 user generated design templates that make it very likely that you will find one that matches your needs. Then it’s simple to overlay your content to replace what is already there. Having tested Canva, I would choose it if I was looking for one tool that would allow me to create all of my digital marketing assets, as Canva allows you to create anything from infographics to gift-cards and posters to pitch presentations. I would also use Canva if I was looking for a free presentation software platform. Canva has a good free option that provides you with most of the features you need for up to 10-users and 1GB or storage. However, you cannot select your brand colors or your brand fonts and lock these down. As good as Canva is, Slidebean is better if you are looking to create presentations. Slidebean is just easier to use and the end results look more professional. In addition, Canva does not provide a free image library, you cannot embed videos or GIFs into your presentation and customer support is only available via online resources. 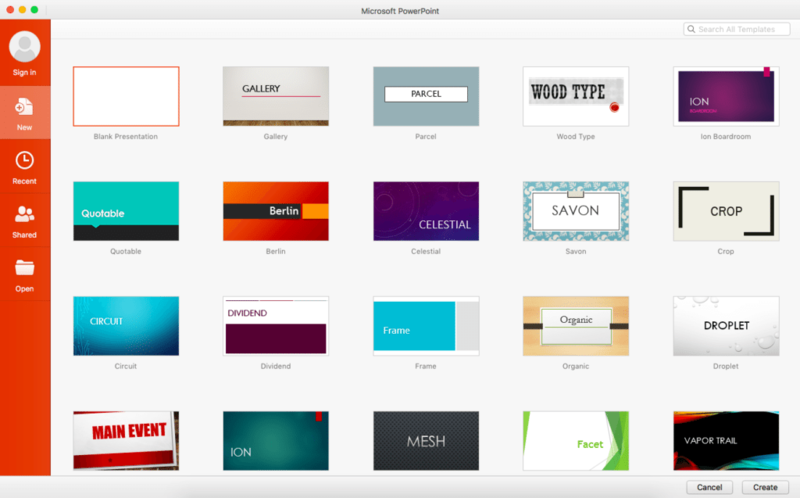 PowerPoint is the ideal presentation software solution for Microsoft lifers, who know their way around PowerPoint’s numerous and complex features like they’re riding a bike. As the granddaddy of presentation software, PowerPoint is packed with features and both the download and cloud-based version are robust and bug-free. PowerPoint’s software is technically excellent. For instance it works across Android and iOS operating systems on phone, tablet and laptop. Plus it supports most media you can think of. In addition, when it is used by someone with graphic design skills and training in PowerPoint, it can create amazing presentations. The advantage of PowerPoint is also its main downside; you really do need graphic design skills and training in PowerPoint to make presentations that will excite your customers. Why? Because PowerPoint is much more difficult to master. If you are not a PowerPoint expert, you will probably end up with a heading, some bullets and maybe an image. PowerPoint also have one other very serious limitation, which is that unlike the other options, you cannot lock down your fonts, logo and colors to ensure that your visual brand is consistently presented in the right way. Read on to find out how each of our 3 presentation software options compare in detail across key features and service support. All 3 presentation software options have have a suitable price point for small business and provide unlimited usage and storage. They also allow you to complete a free trial of the paid package before making any financial commitment. Slidebean costs $24/user/month for the first user licence, but if you need 3 licences then the cost comes down to $13/user/month and $10/user/month thereafter. Fairly uniquely, Slidebean includes a dedicated account manager, professional designer consultation time and design reviews into the monthly cost. Not a bad idea given how many poor slide deck presentations I have sat through that were created in perfectly good tools. Slidebean provide a 14-day free trial, which you can cancel at any time. Unlike Canva, Slidebean does not have a free version. 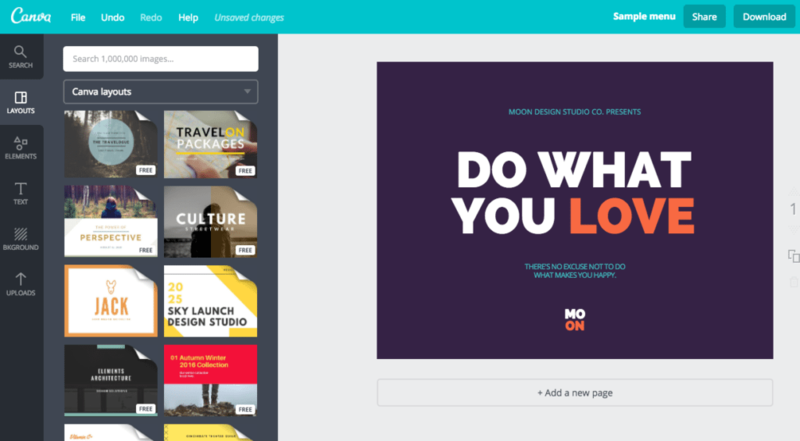 Canva provide a 30-day free trial, which you can cancel at any time. Canva costs $12.95/user/month, which represents good value for money given Canva comes with over 8,000 templates. Unlike Slidebean and PowerPoint, Canva allows you to create a lot more than just pitch presentations. You can create over 30 different document types, ranging from infographics to newsletters, posters and presentations. Canva allows you to access and insert images into your presentation at a cost of $1 per image. There are some free images, but very few and not the ones that you want to use. There is also a free version of Canva, which provides all of the basic features for up to 10 users and 1GB of storage. If your business already subscribes to Office 365 for things like MS Word, Office and Outlook then Powerpoint comes as part of this package, which costs $5/user/month. If you don’t use Office 365 then you will still need to buy it to get PowerPoint as it cannot be purchased separately. PowerPoint provide a 30-day free trial, which you can cancel at any time. Office 365 only provide a free version for student and school use. For small businesses, the most important factor when choosing presentation software is ease of use and the ability to create professional looking presentations without the need for extensive training or graphic design expertise. Slidebean is refreshingly different from every other presentation software I have experienced, and I have experienced most. All you have to do is select a template to use and input your content assets. 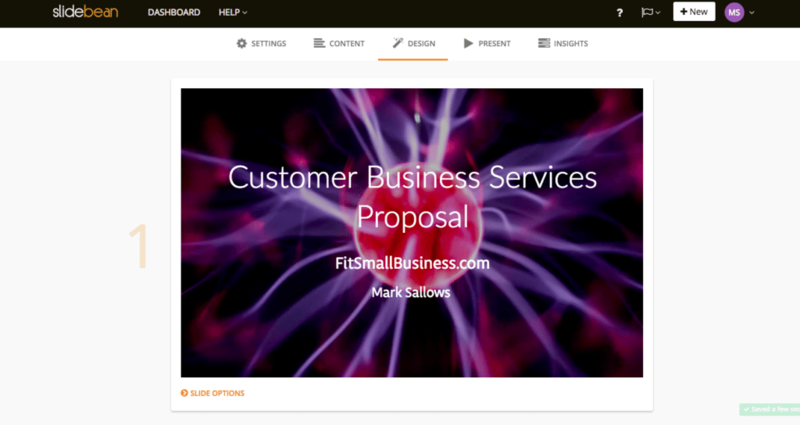 Slidebean then turns your content into professional looking slides and allows you to apply your business font and color preferences consistently to all slides in one click. Compared to PowerPoint, the finished results take a fraction of the time to create and look much more professional. Compared to Canva, Slidebean is easier to use. Like Canva, Slidebean allows you to collaborate when creating your presentation with other team members in real-time. This is very useful, especially for distributed teams. Even though Slidebean is the easiest presentation tool to use, it also comes with dedicated account and design support, which I am not aware of any other presentation tool building into its service. This recognizes that it’s difficult to make things look great if you are not graphically blessed, and allows you to get those important presentations just how you want them to be. Slidebean does not currently have a mobile app version, but there is a nifty mobile app that turns your phone into a remote control for presenters. Like Slidebean, Canva is also refreshingly different in concept to all the PowerPoint clones. You simply select a template that you like the look of from over 8,000 currently available and overlay the content that you want in your presentation. 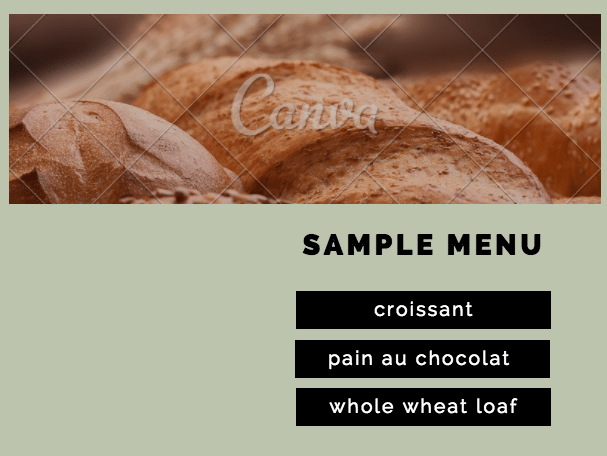 Canva also has a great feature that automatically re-optimizes your image if your crop it or change its dimensions. See the two layouts below which I was able to create in seconds because the tool magically makes the image still look great. An example of how Canva automatically sets images to look great. Like Slidebean, Canva allows you to collaborate when creating your presentation with other team members in real-time. Canva has a great mobile version that allows you to create, edit and present on iPad. The downside of Canva is also one of its strengths. There are so many template options that you can end up spending much longer that you want to find the right one to use. But once you do, it’s like cooking on gas. PowerPoint can be used straight out of the box. You can select a template to use from 100s available. You can then add text, images, video and more to build your slide presentation. One of the great things about PowerPoint is that you can embed video that will work offline if you buy Office 365 Business for $8.25/user. Whereas Slidebean and Canva rely on connecting with cloud based services that cannot play video offline. If you purchase the Office 365 Business Premium you can create, edit and present in PowerPoint on Android and iOS phones and tablets. The downside with PowerPoint is that if you need to be gifted to make professional looking presentations. This is because it is much harder to use, and takes a lot longer to create presentations compared to Slidebean and Canva. Plus when you have finished, there is the distinct possibility it still looks like a boring, out-dated PowerPoint presentation unless you have a design professional on your team that knows how to make PowerPoint sing. 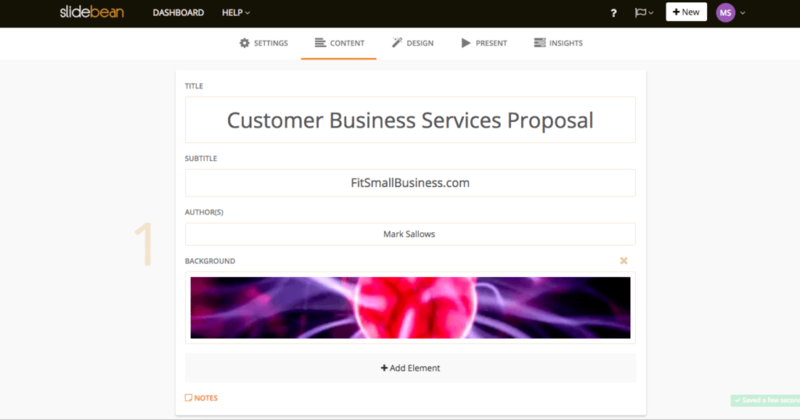 All 3 of our options use templates or themes to make it easier to create presentations. They also allow you to display images, video and graphs. Let’s look at how they differ. Unlike Canva and PowerPoint, you can insert millions of rights-free commercial commons images and GIFs for no additional cost. Canva allows you to insert images, but they cost $1 per image. This will make Slidebean more cost effective if you are using images to liven up your presentation as much as you should be. Like PowerPoint, Slidebean also allows you to insert video from YouTube, Vimeo and Wistia. Vimeo and Wistia are great options to have because they allow you to gather analytics on how your customers view video in your leave-behind presentations. Like Canva, Slidebean also have an awesome tool that makes it really easy for anyone to create bar, line or pie graphs. This is important if you are intending to give a sales presentation, as people like to be given the facts in an easy to digest visual format. Like Canva, you can lockdown your color and font choices to ensure that regardless of who is using Slidebean, the presentation is always on brand. Canva has over 8,000 template themes to choose from. However, most are user generated and so the quality is somewhat variable. I found that you can find the perfect one to use, but it takes time more time than it does in Slidebean. There are over a million images to choose from in Canva and some of these are free. However, you do have to pay $1 each for the vast majority, which are always the ones you want to use! One great thing about these images is that if you change their shape or size, they magically re-organize themselves to look perfectly formatted again. Unlike Slidebean or PowerPoint, you cannot embed video in Canva at present. To show video, you have to insert a hyperlink and take your audience out of your presentation and off to YouTube or another video platform. Like Slidebean, Canva makes it very easy to create all the usual types of graph. Unlike Slidebean and PowerPoint, you can also create a useful range of venn diagrams. Also like Slidebean, you can lockdown your colourways and font choices to ensure presentations are always on brand. PowerPoint has 100s of templates to choose from, which include fonts and basic colourways, but not graph-treatments and sample images to help the non-graphically blessed to understand what they are aiming for. It’s to have so many options, although most feel somewhat dated. PowerPoint does not include access to a free or a paid image or GIF library. If you are used to using presentation tools then you can go and get your images from an image bank service and insert them. However, many people will struggle to work out how to do this by themselves or simply not have the time to learn. 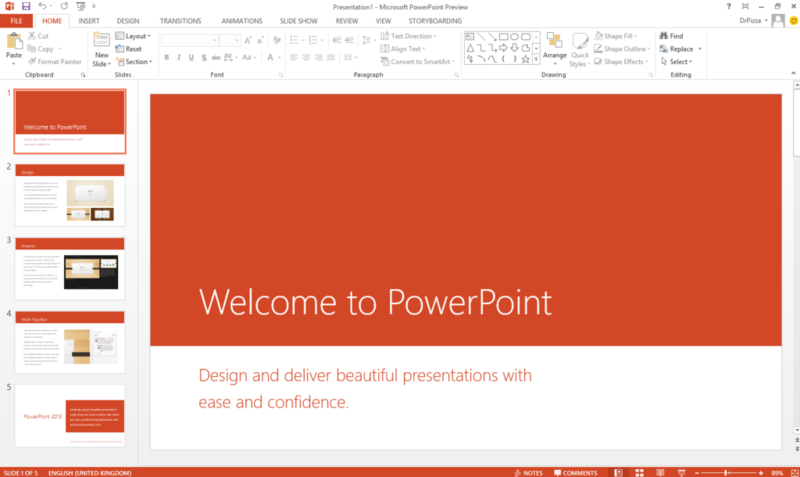 PowerPoint allows you to embed all common video formats. Unlike with Slidebean and Canva, you can store video’s on your device and still play video when offline. PowerPoint also have one of the most sophisticated graphing tools that provides you with the freedom to create a massive range of different types of graph, including 3-D charts, for instance. The problem is that you have to either get training or invest a lot of time to learn how to use the powerful features and options available to you. One major drawback of using PowerPoint as your presentation software (like all Microsoft products) is that you are not able to lockdown your brand colour and font options to ensure that all of your users stay on-brand. Something that most sales reps would view as essential but very few presentation software products provide is customer analytics. These come into play after your sales rep has completed their sales pitch presentation and left their presentation with your customer prospect to reflect on. Only a few presentation software tools recognise the importance of providing insight into when your prospects review your pitch, what they are most interested in and how long they spend considering your cost proposal section. This feedback can also help you to refine and improve your pitch presentations. Slidebean: Slidebean allows you to track your viewer’s behavior for each presentation. You can find out how long they spend viewing the presentation, which will give you an idea of how interested the are. What time they reviewed your presentation, so you know when would be good to call and which slides that looked at for the longest so that you know what to talk about. This is a key feature that is very useful for any sales team pitching and leaving a leave-behind with the customer as it provides a window of insight that helps sales reps to close more deals. Canva: Canva does not currently provide customer analytics. However, they are planning to provide advanced customer analytics with their new enterprise version, which is coming soon. PowerPoint: PowerPoint does not provide customer analytics. With some tools customer support is not very important, because the tools just work and it’s easy to make them do what you want. This is not the case with presentation software. The tools do just work, but it’s rare that a non-graphic designer creates a professional looking presentation even with the best tools at their finger-tips. Let’s see what our 3 options do to recognise the need for customer support in the right areas. Slidebean: Slidebean provide you with a named, dedicated account manager who is available to provide you with phone and email support 24/7. What’s more, included in the monthly subscription is a 1-hour phone call with one of Slidebean’s expert designers to get the best tips and advice on how to take your presentations to the next level. 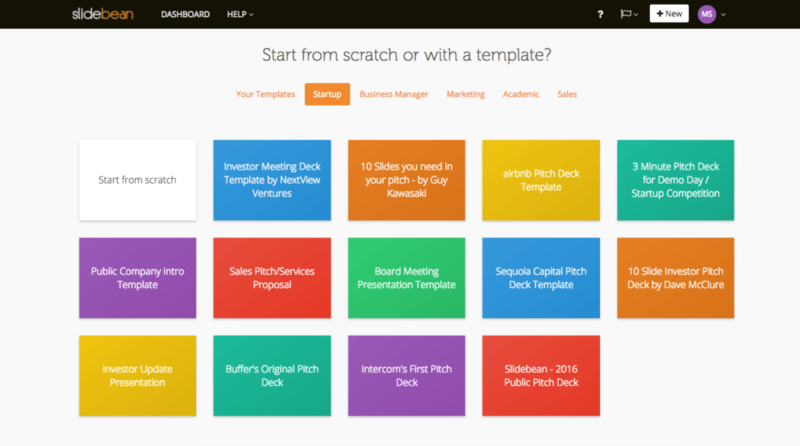 If you have a really important presentation to prepare like a pitch for key customers of investors for example, you can pay Slidebean to create it for you. This cost of this service is in the range of $250 to $350 depending on the level of complexity of the presentation. Canva: Canva does not currently provide phone or email support, but they are planning to introduce dedicated account managers with Canva Enterprise, which is coming soon. 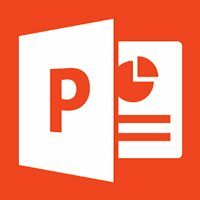 PowerPoint: PowerPoint does not provide any dedicated account support. However, it does have a very comprehensive knowledge base. Here are the 7 best presentation software options currently available that we reviewed before selecting the best 3 to review in more detail. Slidebean Business and sales pitch presentations Slidebean is the easiest presentation software to use and allows non-graphic design experts to create professional-looking presentations in minutes rather than hours. Canva Small business Canva allows you to create anything from professional infographics to sales decks and posters. What’s more it’s powerful and very easy to use. PowerPoint MS Office users If your business uses MS Office, PowerPoint comes as part of this package. 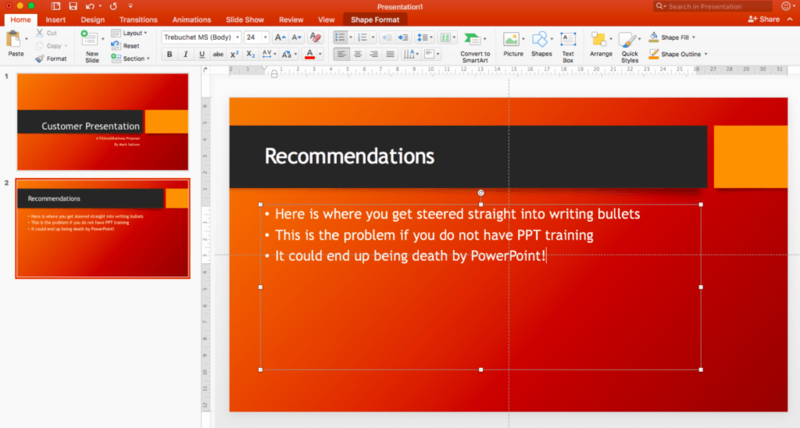 PowerPoint is a very powerful package, but you really need proper training to make it sing. The sort of time investment many small businesses struggle to make. Haiku Deck Image heavy presentations Haiku Deck is a great system for creating more engaging (less corporate) slide presentations in minutes. It also links to millions of rights free commercial commons images. Google Slides Free real-time collaboration Simple and robust, Google Slides is like a simple version of PowerPoint. What’s great is that you can collaborate in real-time with colleagues when creating your presentation. Prezi Non-linear presentations Prezi lets you create non-linear, dynamic presentations without traditional slides. However, the dynamic nature of the transitions does make a lot of people (me included!) feel sea-sick. Is it the most intuitive and easy system to use? Can a non-graphic design expert create professional looking presentations? Does the cost represent good value for money? I recommend Slidebean because it provides the best answer to these 3 questions. 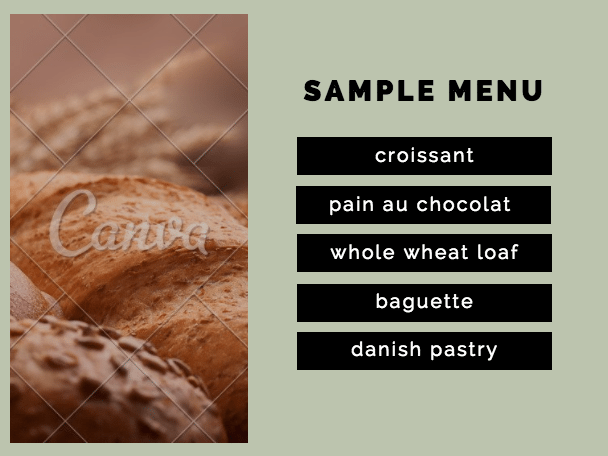 However, if you are looking for a tool to create all of your digital sales/marketing materials, then you may want to consider Canva. This is because it lets you create anything from infographics to giftcards and from posters to pitch presentations. Then again, if your business already uses MS Office and you have a PowerPoint expert in your team then you should probably use PowerPoint as it comes as part of MS Office and it’s a very powerful tool in the right hands. I will always choose PowerPoint over any of the loudly touted presentation softwares. One thing most people haven’t realized is how much PowerPoint have changed over the years. Most people still like to think it is just a tool for boring presentations. If we realize how much of the content creation that is possible with PowerPoint we will eat our “death by PowerPoint” words. The recent morph feature of PowerPoint alone more than blows my mind plus the fact that recently you can render videos in 4K. What beats that? No, like seriously, how do you beat that? I am currently working on a Masterclass for using PowerPoint for all content you can possibly think of …infographics, videos,ebooks, business documents etc. all in high resolution. Watch out! Hi Jeremy, is this a sponsored article? I may be wrong but I think Prezi requires your credit card details from the start. My Sales and Marketing company (Spring Communications) has been using https://presbee.com for a few months now, because it is free, it makes us look smart, has much better features and a remote meeting facility, so saves on travel too. At the time I wrote this article, Prezi did not require a credit card for the free version. Also, this article is indeed sponsored, but we only form relationships after writing the article and determining who we think is best. In other words, we’re always open to considering new companies. I’ll look into reviewing Presbee during the next revision. Thanks for the comment, Sherwin. We’ll take a look. The import feature (from PPTX to eMaze) does not work very well. Sometimes so many slides are badly imported that it is preferable to just re do it in eMaze. That’s unfortunate to hear. But thanks for sharing and letting our readers know. The online version can be used for free. The only limitation is that presentations will be public. The 14 day trial is only for the Prezi Desktop application. Prezi also supports Flash SWF files. Since 2016 Prezi also has a Charts feature (for paying users) which generates customizable charts from data tables. Thanks for the clarification. We’ll update the article to mention the free version.